Hatters boss Nathan Jones is well aware his side are in for a huge test of their promotion credentials this evening when they host Wycombe Wanderers. The Chairboys have won five out of their last seven League Two games, to climb to fourth in the table, 11 points behind Luton with a game in hand. We’ll expect a massively tough test because every single game we’ve played against them we’ve had that. 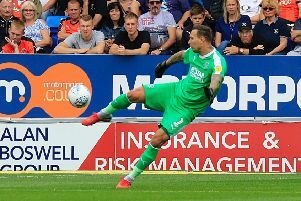 They are no strangers to success at Kenilworth Road either, as until last season’s defeat, had triumphed on their previous three visits, with Jones saying: “You always know you’re going to get a game from Wycombe. “They’re in fantastic form, they’ve put themselves in a good position, the manager has done fantastically well there. “They’re perennial play-off, promotion challengers every single year and that’s the the job that Gareth’s (Ainsworth) doing. When asked if he felt that Wycombe were punching above their weight due to the finances on offer at the Causeway, Jones continued: “From the outset you think that, but they’ve got good players. “I don’t know their budget and don’t know their recruitment and what restrictions they have, but every single year they keep producing teams that cause problems and win games and are at the right end of the table. “They were unfortunate in the play-offs a couple of years ago, after having two tough games against Plymouth, but he’s (Ainsworth) done a wonderful job there. Larger than life striker Adebayo Akinfenwa is Wanderers’ top scorer once more this this season with 13 goals to his name, although on whether it is harsh to label tonight’s visitors a long ball team, Jones added: “Yes, I think so. “They’re high scorers, they have a potent threat that they use, but everyone would, everyone who had that threat has used it. “I wouldn’t call them along ball team, I’d call them a real forward thinking, very, very incisive team.